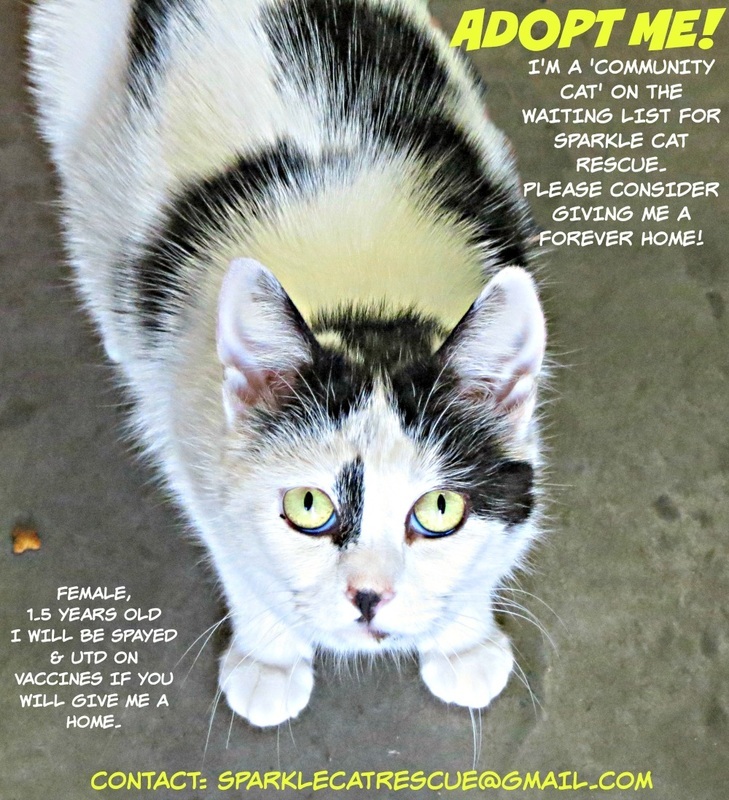 If you would like Sparkle Cat Rescue to courtesy post cats you are wishing to rehome, please submit the Courtesy Post Form (see file download to the right). We will share on Facebook and here on our website. If you have any difficulty downloading the form, please email us and we will send you one via email. 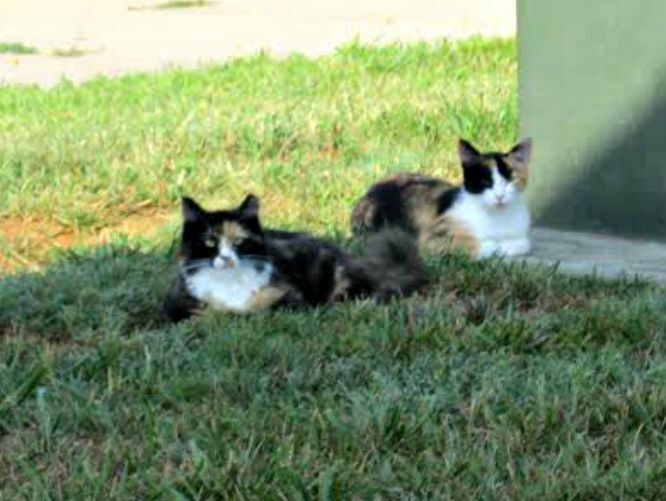 These cats are not in the care of Sparkle Cat Rescue and are being posted as a courtesy. Unless specifically stated to the contrary, Sparkle Cat Rescue has not evaluated, met or in any other way interacted with these animals. 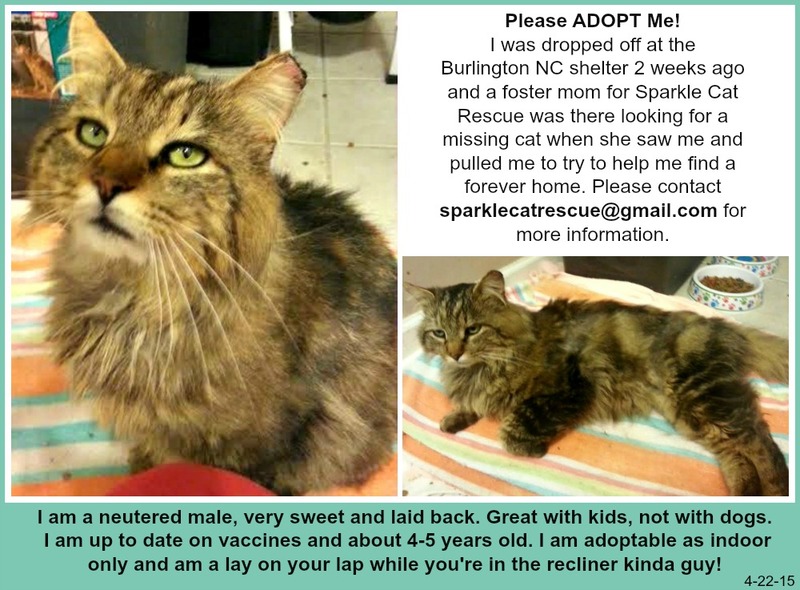 Consequently, Sparkle Cat Rescue makes no representation as to the temperament, health, or suitability of these cats. 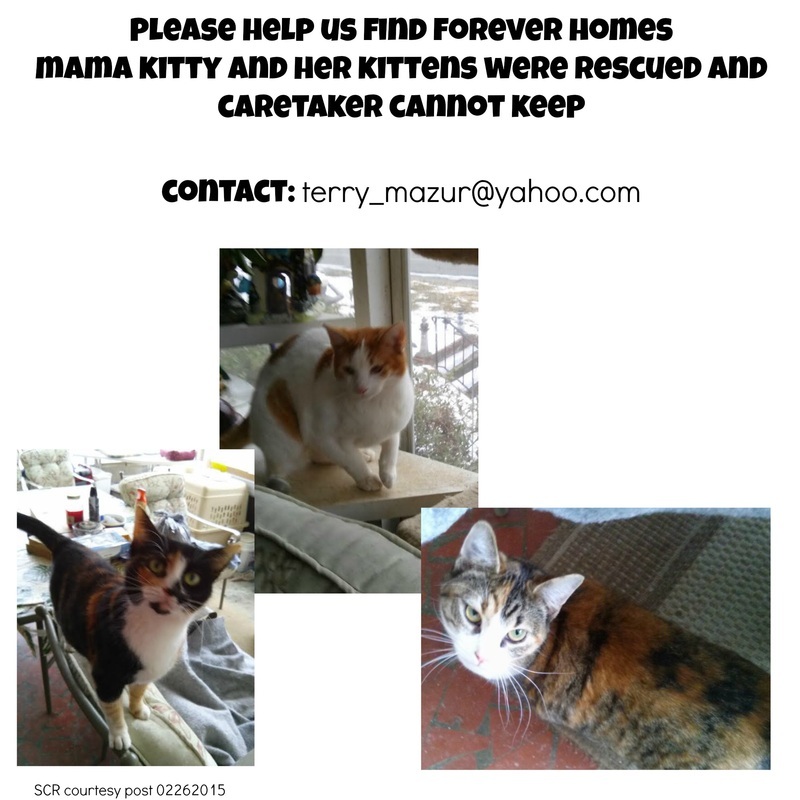 Posted 8-18-15 Owner moving to Colorado and needs to find home for these two by August 23. 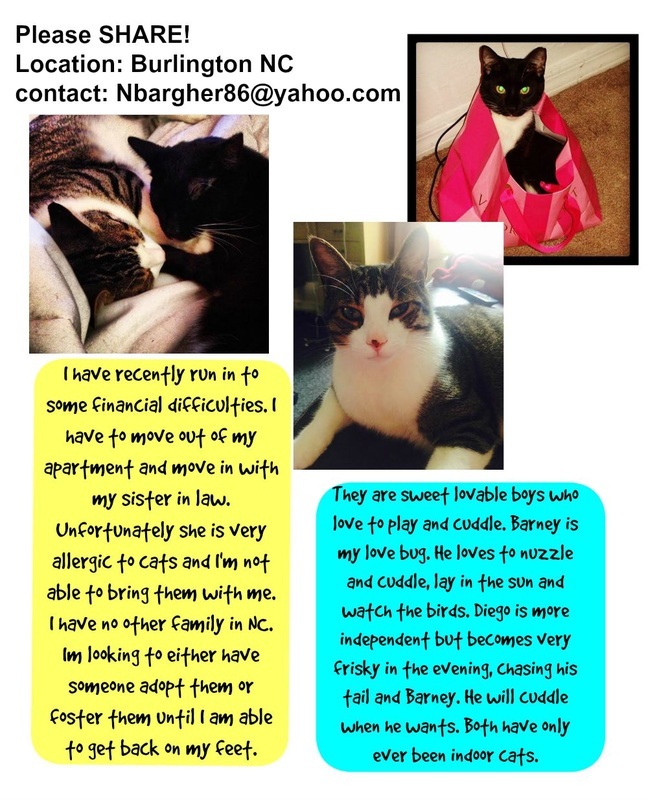 The yellow tabby is EMMY (male - yes with this name) is 4 years old and has been neutered. The black and white one is KITTY and she is 2 years old and spayed. Both are indoor cats and always have been. They do not know what a dog is so going to a home with a dog would require an adjustment period. I would prefer not to separate them but will if I have to in order to find them good homes. 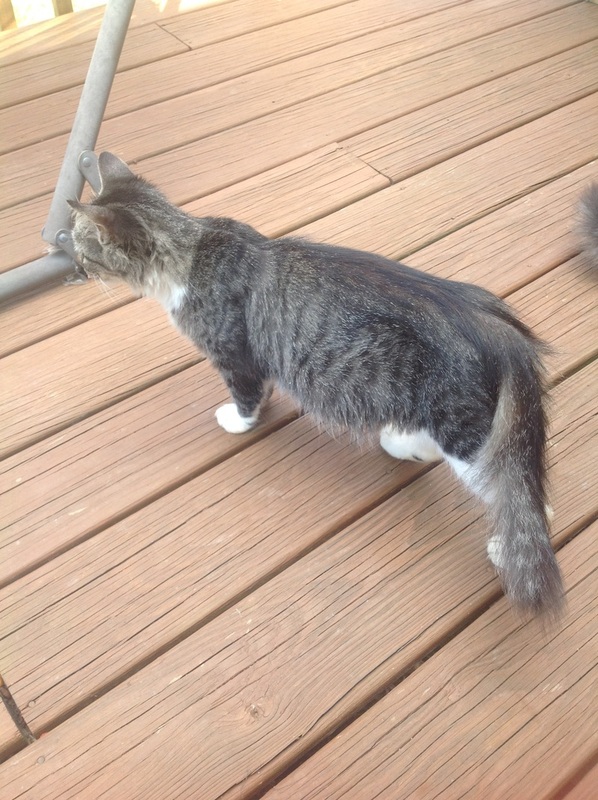 "I need to find a home for Tabitha-a blind spayed female cat between the ages of 10-12 years. She was my aunt's cat, and when my aunt passed away in November 2014, I adopted her because my aunt's stepson was going to place her in an animal shelter. 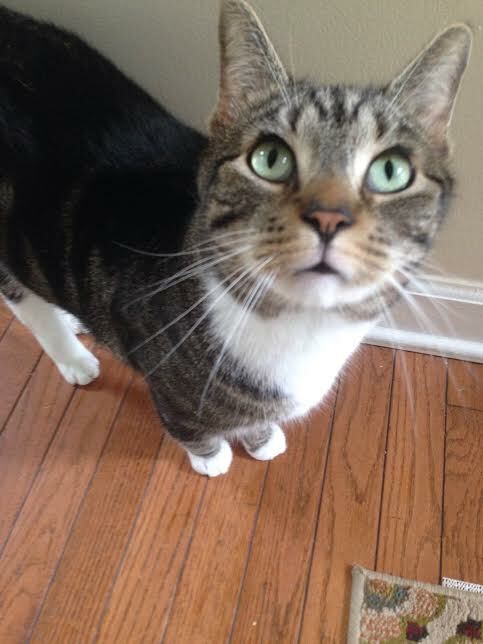 Since I had previously adopted two cats from the Orange County Animal Shelter in December 2013, when I brought Tabitha to my home I thought it would be best to keep her separated from my other cats. I placed her in my basement which is large, but smaller than my house. She is able to find her way around by her sense of smell and touch. 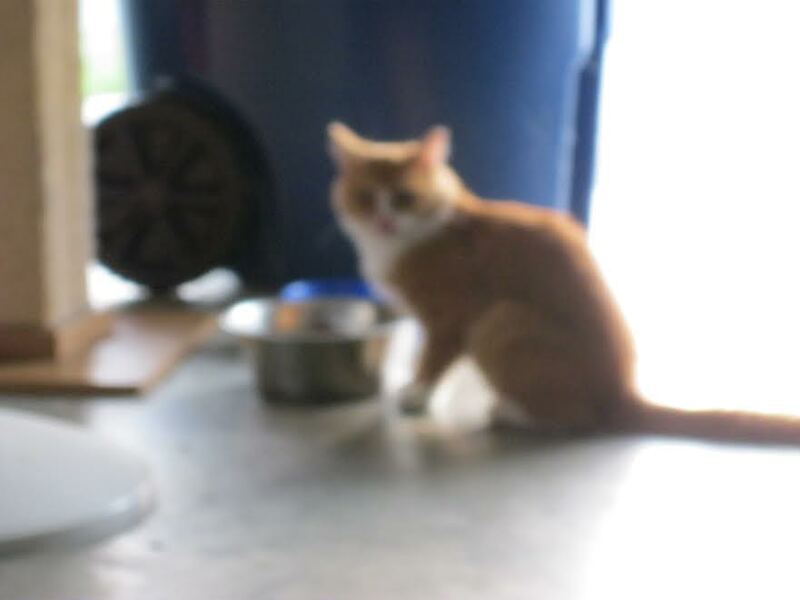 She has no trouble finding her litter boxes--even if they are moved, and finds her food and water easily. She can even run up and down the stairs! The other reason I decided to place her in the basement is because one of my cats was acting aggressively to her and I did not want her to be hurt or scared. Due to medical issues I am experiencing, I am no longer able to care for her. 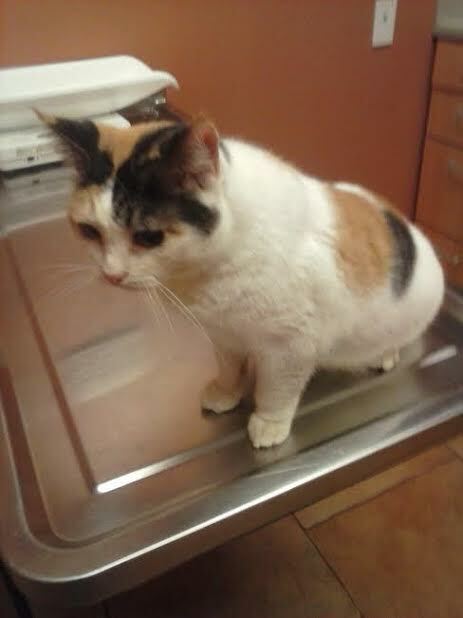 Tabitha is up to date on all her vaccines (rabies, distemper, and leukemia), and she is treated monthly with Frontline although she never goes outside. 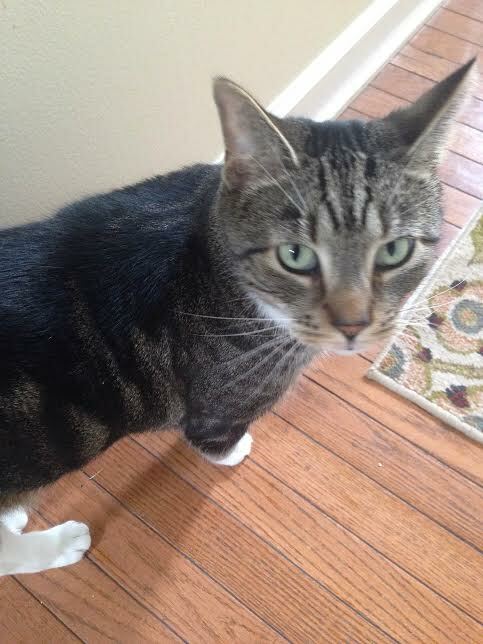 Tabitha is a very sweet, quiet cat that loves to be petted, but is not demanding of attention. She has no health issues other than her blindness which is due to cataracts. 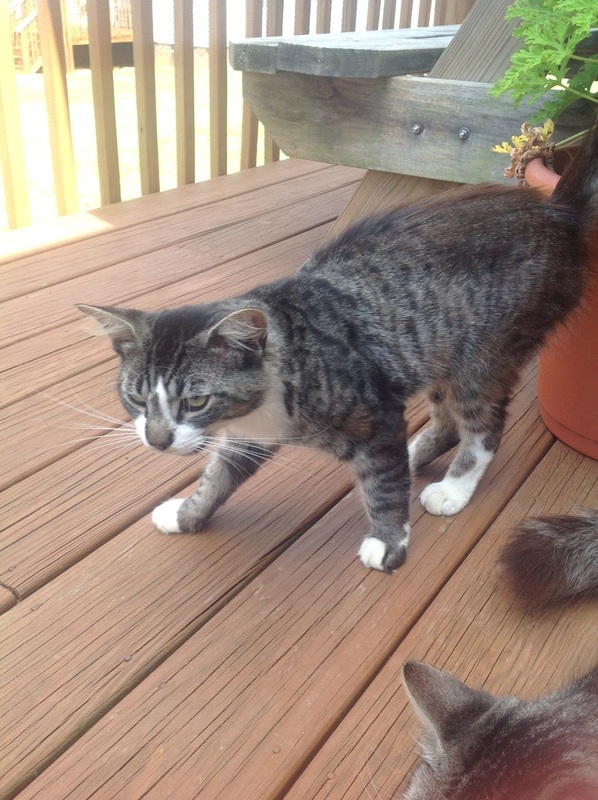 I just really need to find a home for her with someone willing to accept a blind cat." We received a call from Sunny about some kitties that wandered up as strays - two females had kittens and a third had kittens before we could get her to Dr. East to be spayed. Sunny needs help in finding homes for all these cats. 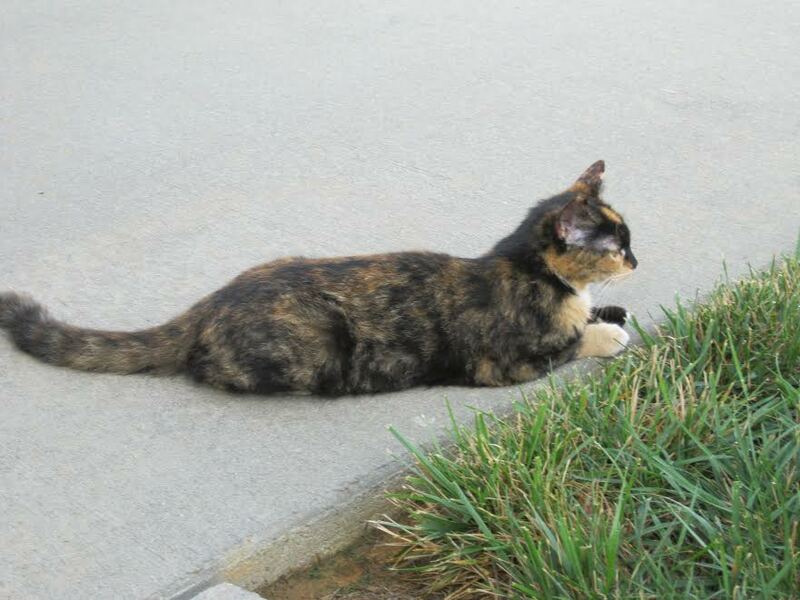 One mama cat was abandoned by Elon students who kept her kittens but let her go! To inquire about the cats and kittens in these 12 photos below, please contact: sunshinetwins@hotmail.com Sparkle Cat Rescue has a sponsor who is helping us get females and males spayed and neutered and kittens will be fixed when age appropriate. Sunny needs your help! 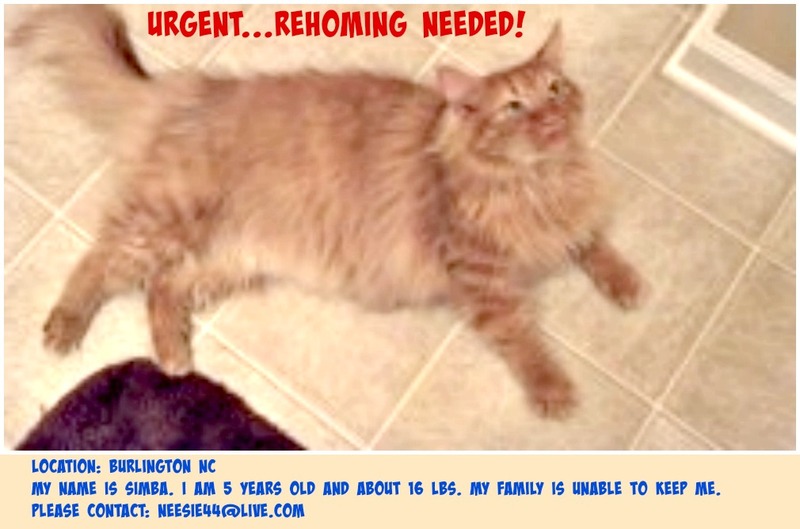 LOCATION: Whitsett - willing to meet adopters in Burlington. Caretaker is willing to get them fixed and first vaccines. 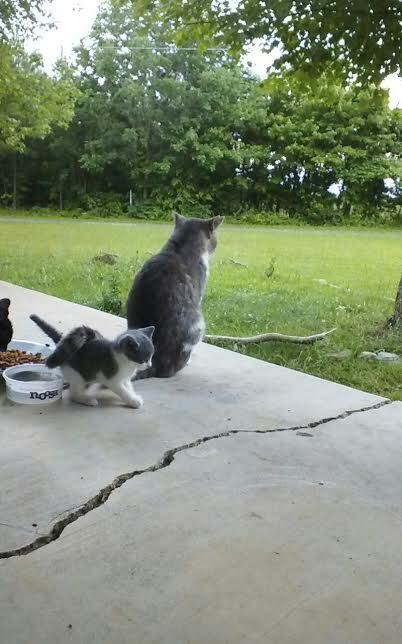 Mama cat is going to be fixed and the caretaker will keep her. 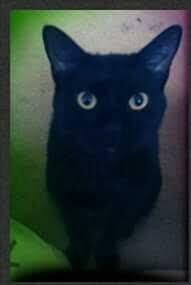 "Nina Bonita is a beautiful black kitty. Her name means "Beautiful Girl" she is about 3yrs, she has been spayed and chipped by forysth county animal shelter and I have papers. Nina does like little children, she has had a horrible expiernce with them causing her anxiety to be very high and she doesnt trust men easily. She loves when i am laying down or sleeping because she will come lay on me or cuddle up next to me. When she is comfortable and calm she loves attention. She does love high places, places to hide and baking in the sun of any window, she plays tag with my younger cats Armani and Kai, but she is usually hanging out by herself. She hates loud sounds and will freak out and is not fond of being picked up, she will come to you on her time. If there are other cats it takes a minute for her to warm up. 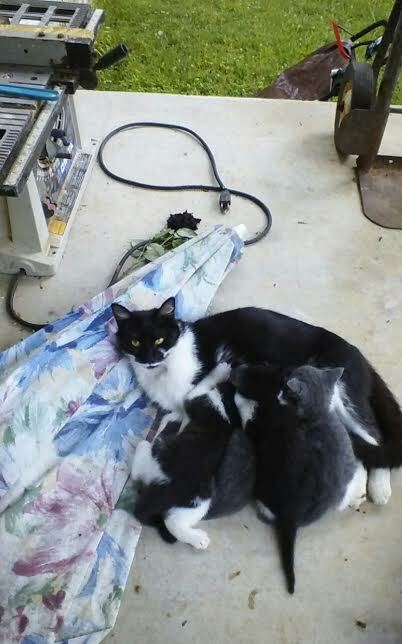 Im not sure about kittens, she was not spayed at the time I brought the younger cats home, but she treated them like they were her babies." "Armani and D'Kairo are brothers and almost 2yrs. They are inseparable and if separated they both get very depressed, they will not eat, and will cry all the time. D'Kairo has a medium/high anxiety level and needs to get warmed up and coached to everything is okay. Armani loves being called Armani Boy in a sweet loving soft voice. Kai's anxiety will kick in over loud noises. They will probably be okay with older teens but i am not sure, they tend keep away from small children but do not react to children either. They are very active together but when calm they love laying on beds, baking in the sun of any window and just chilling out, both are very vocal when hungry and love human food. Armani is neutered by Forsyth Humane Society and has been deemed unadoptable because of his depression without his brother and Kai has an appt to be next week to be neutered. 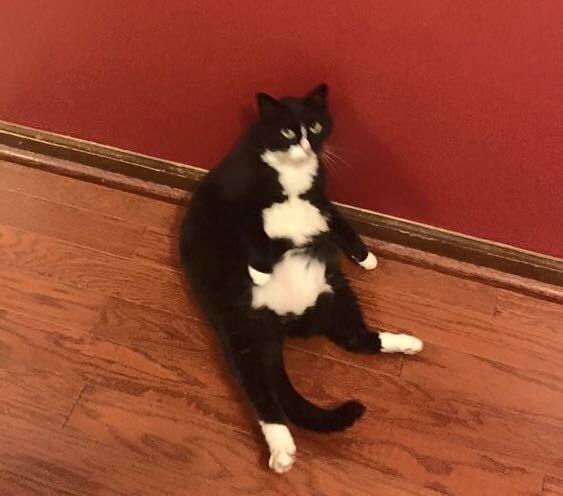 Armani is brownish grayish and is the cat that is "if i fits, i sit" type of cat and Kai is black and white tuxedo and loves to climb and hide and pounces on Armani." 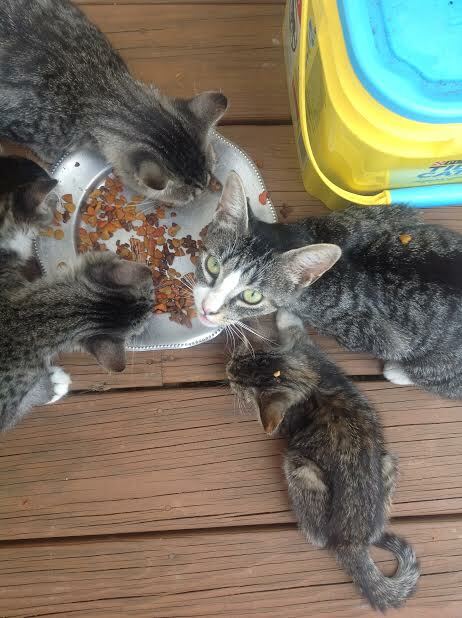 Stray mama had her kittens and Stephanie is hoping to find them good homes. They appear to be about 6 weeks old. Gorgeous babies! Calicos, Tuxedo, and orange and white cat need homes! I'm a very sociable girl! CONTACT: petsitr02@yahoo.com to adopt me! I'm spayed and had my rabies vaccination. I am semi-sociable! I'm a girl! Please adopt me! 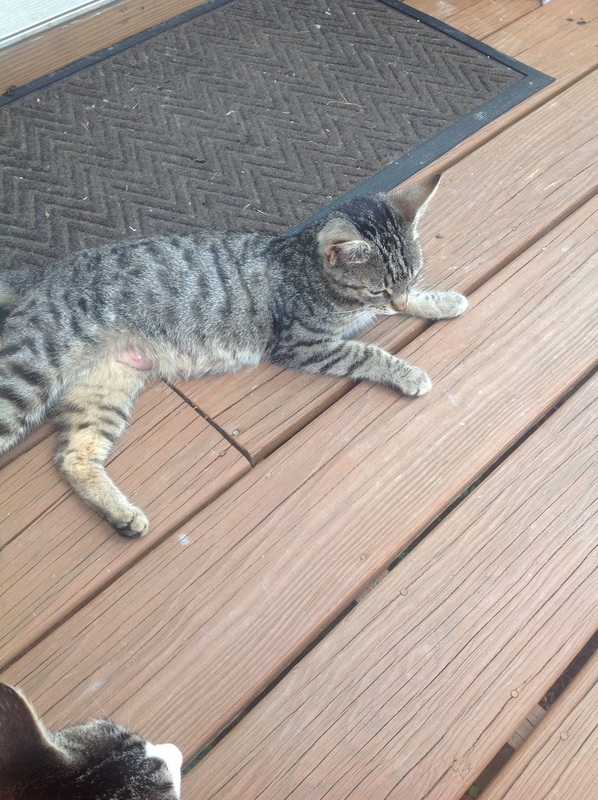 Contact: petsitr02@yahoo.com I am spayed and have had my rabies vaccination. 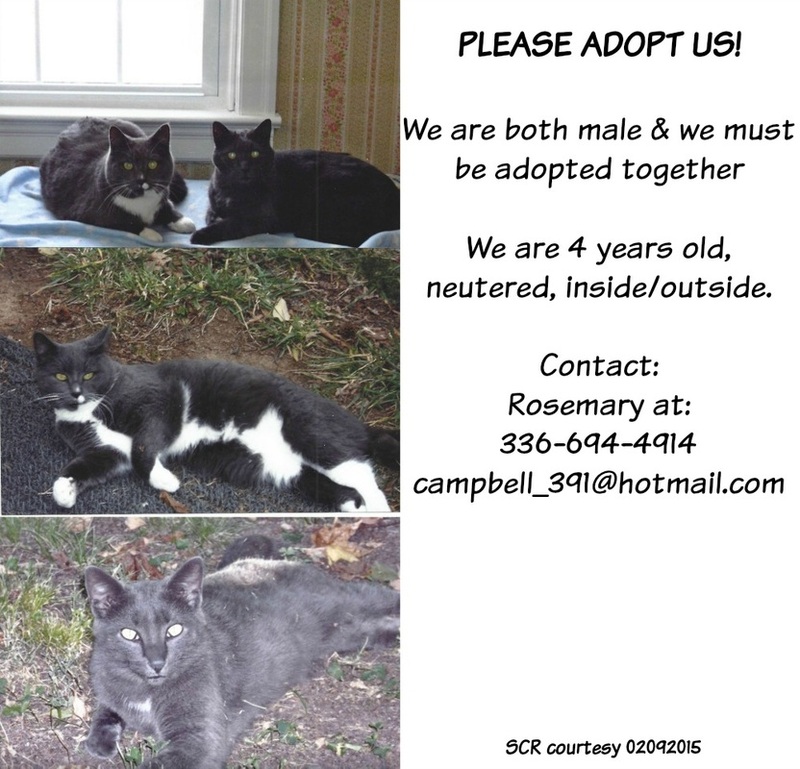 CONTACT: judy_turner@bellsouth.net "Caretaker is offering $40 to adopter for each kitty toward spay and neuter. All she will need is a voucher showing that it has been paid for and she will hand over a kitty and the cash. She must have a voucher showing the color of the kitty picked." 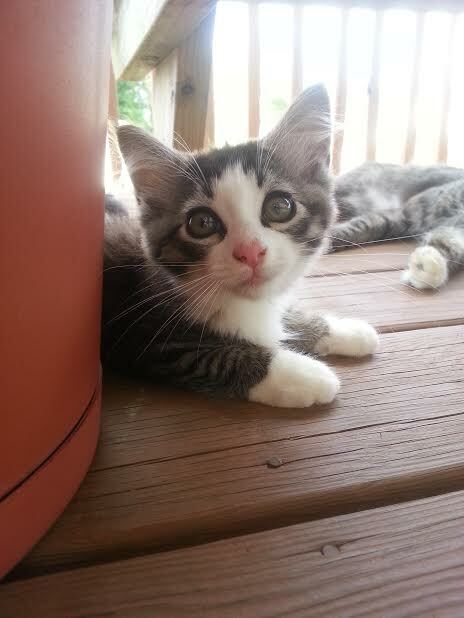 Our mom was a stray dumped down a dirt road. 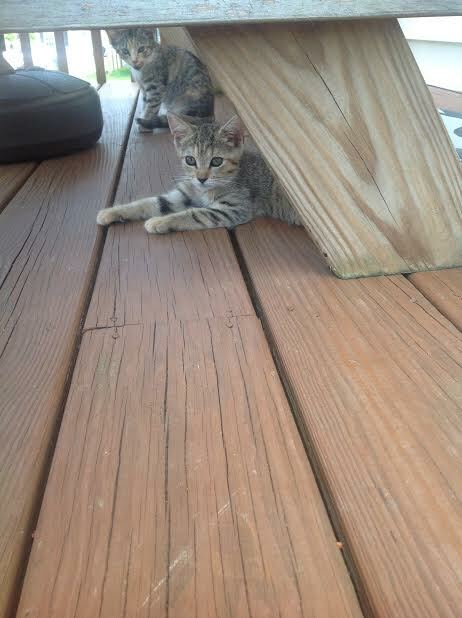 Our caretaker had a small 10 by 34 trailer moved to her property for storage and us 5 kittens were in the floor of it. Our mama cat was found and brought to their home to stay safe inside where we got lots of TLC. 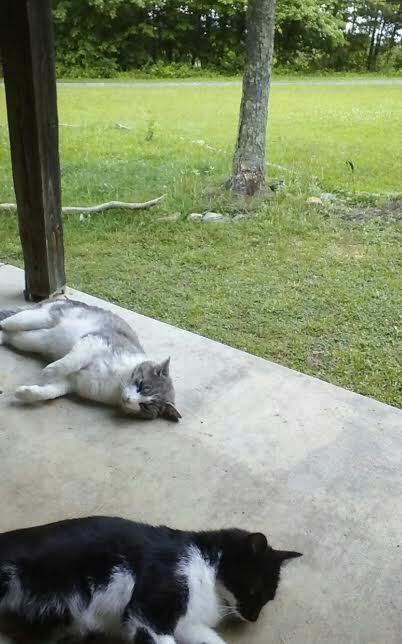 Our caretaker has cats of her own and cannot afford to keep us. 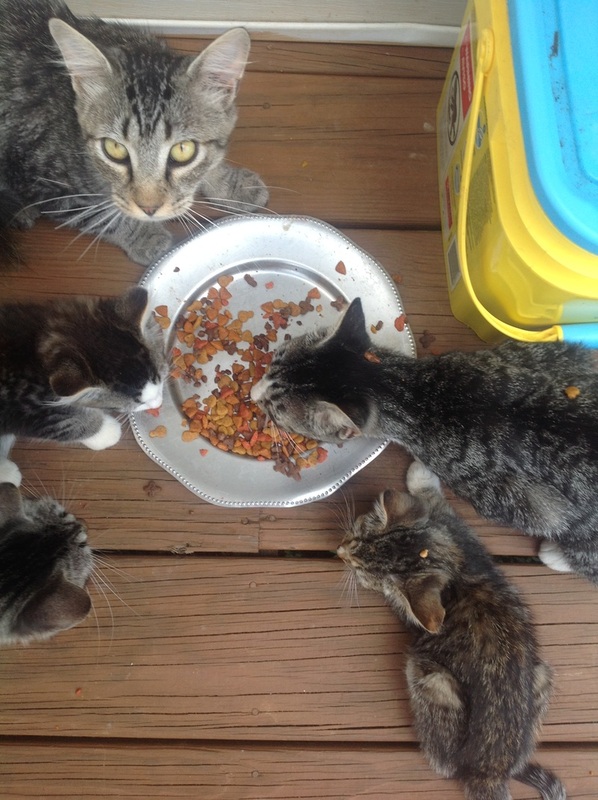 Their cats are all spayed and neutered and have been from the time they first got them. We are thankful to them for helping us when we needed it and now it's time to find homes for us. We had no where to go, but taking on 5 more, is not an option for them. 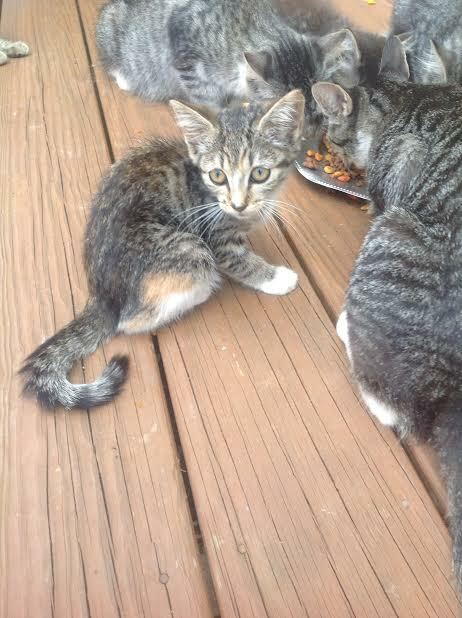 They are getting our mama cat spayed on July 30th, and she has a home. 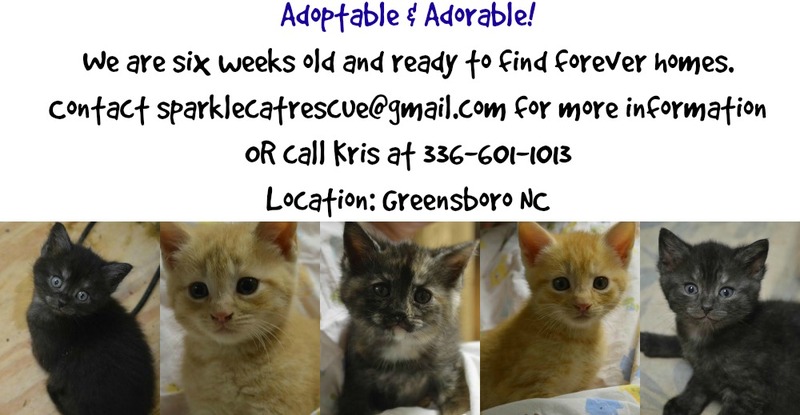 Please help us find forever homes. 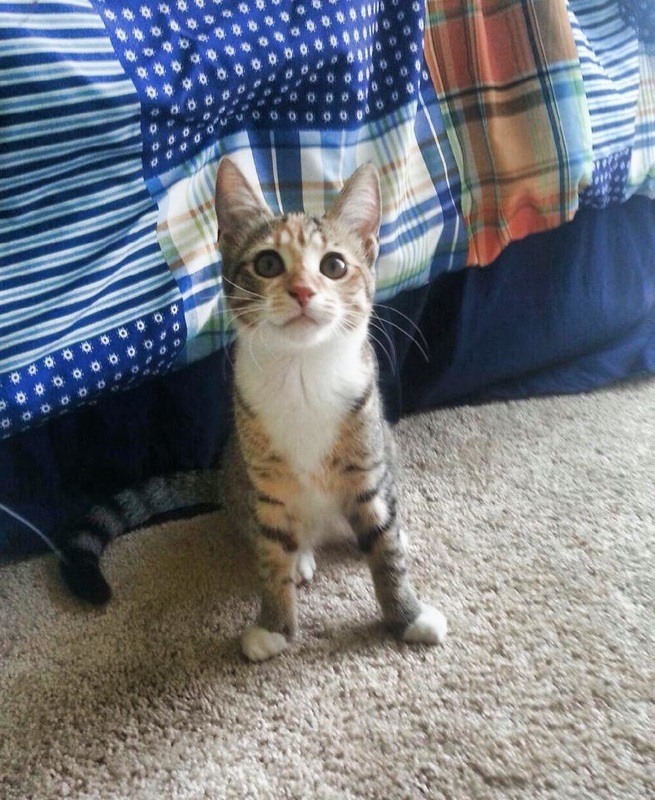 "This is Nala! 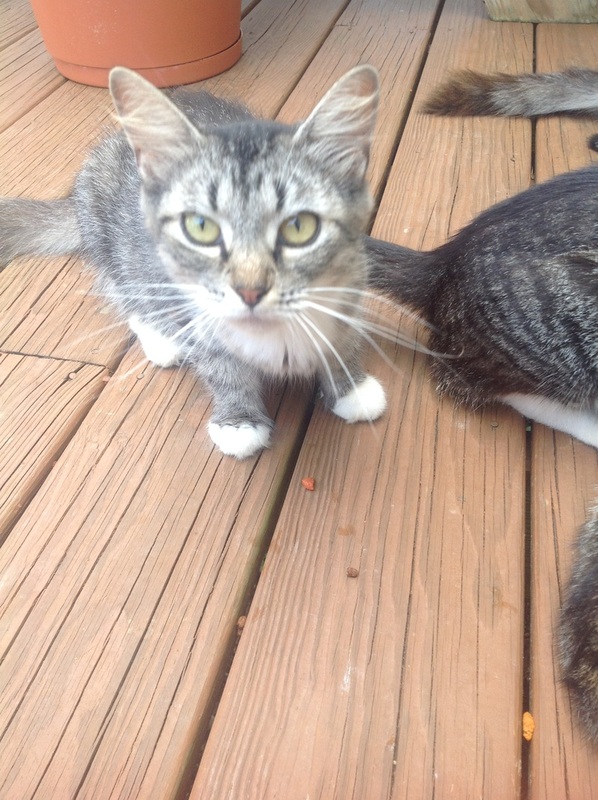 A sweet, playful 3-1/2 month old kitty that loves balled up paper and ribbons. She is very good with children, as I have a 2 yo that runs round the house with her and picks her up when she isn't quick enough. 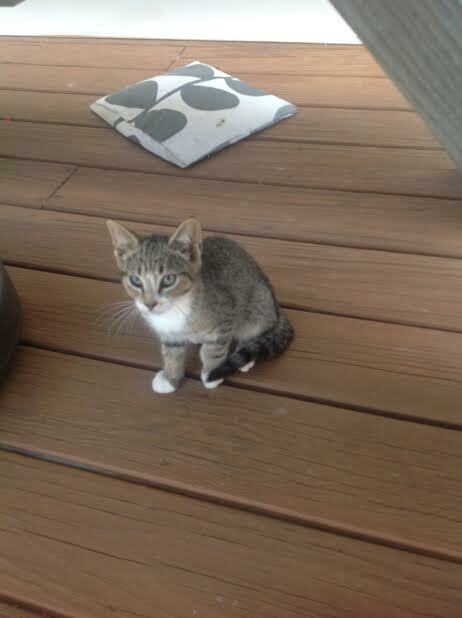 She is litter trained, but hasn't had any shots yet." -10 year old female in perfect health. -Up to date on all shots. -This is a time sensitive situation. 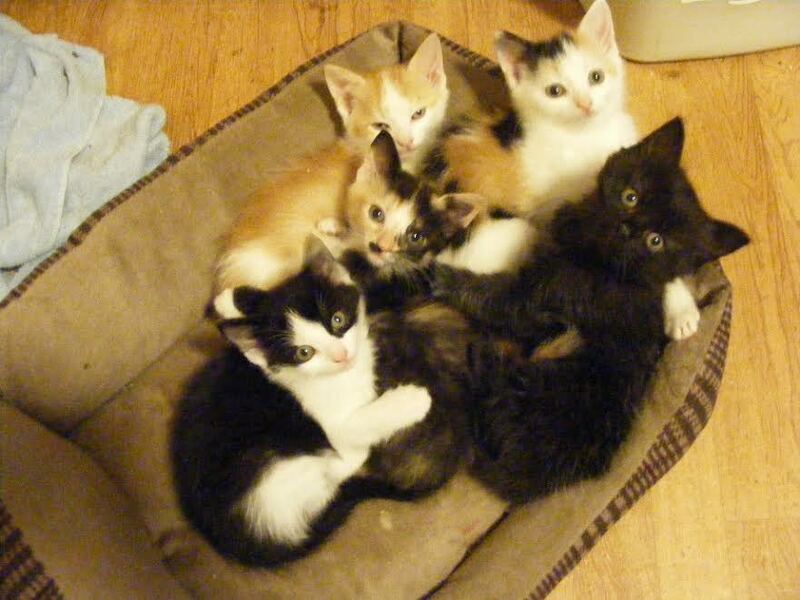 "I found a litter of kittens where I work there were six one had been killed. We think it was accidentally run over. Someone I work with took 3 to find them homes. I took 2. 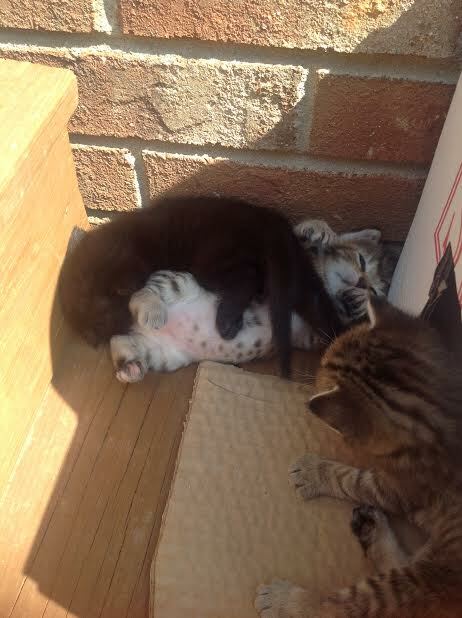 I am unable to care for them while I find them a home. I have 5 animals of my own and a very rambunctious Siberian husky that doesn't understand they are not toys. 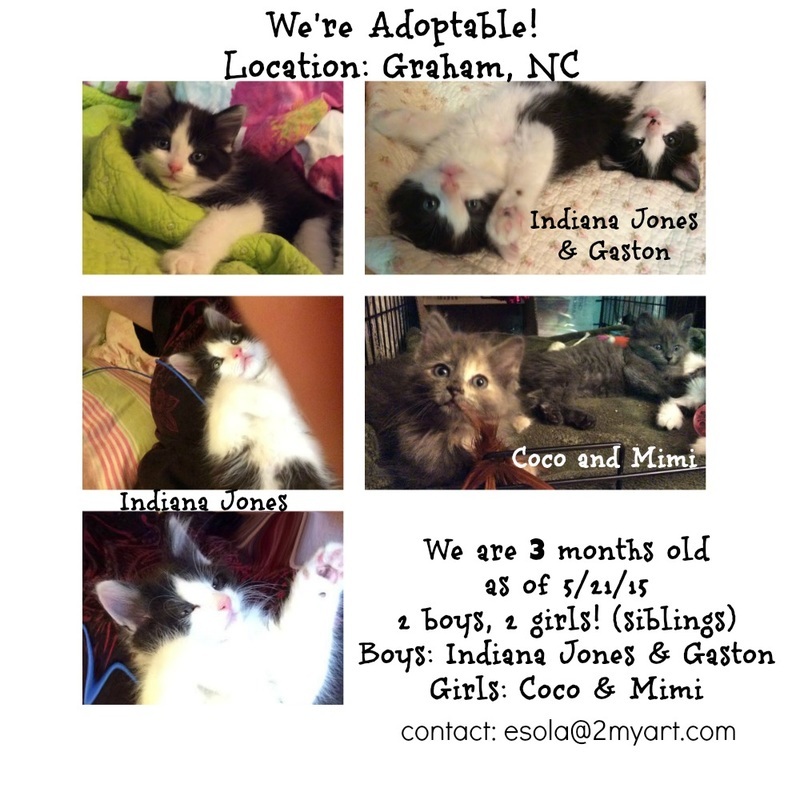 I truly do not want to have to carry them to the Guilford County animal shelter." 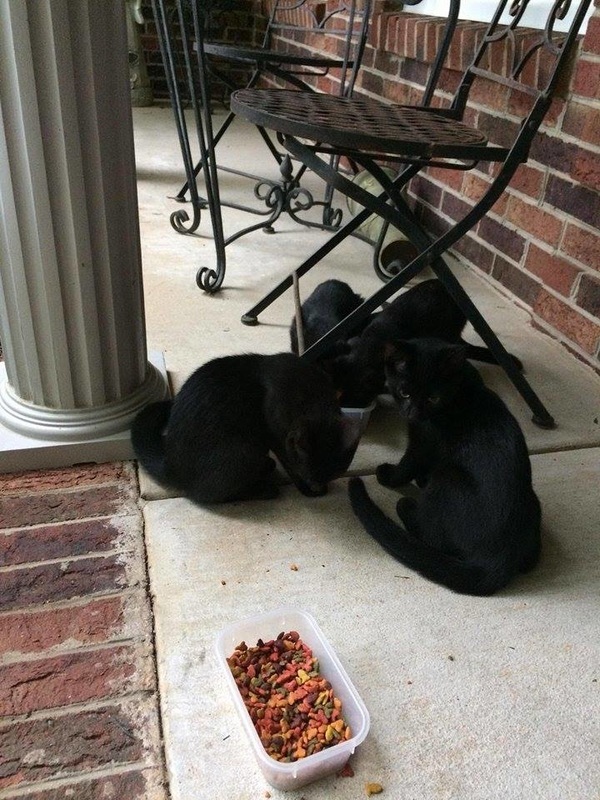 Message from caretaker: "About 4 weeks ago, a mother and father cat began taking up residence on my porch because I refuse to turn away a hungry mouth. Then one day they brought up two of their kittens. Two females who looked just like momma. Then, two days later, they brought up the other two of their brood who looked like dad and were males. They were pretty scared, but all adjusted to people quickly, including dad. They still nurse occasionally, but they all like cat food. And eat a LOT of it!. 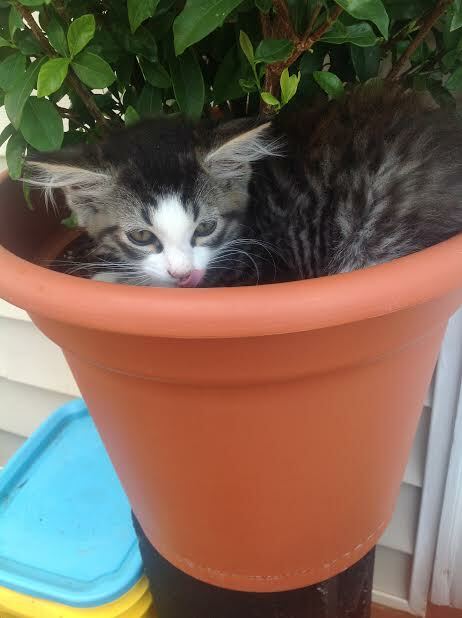 I need help with finding homes for these kitties. I can't afford to worm them. I put flea treatments on the parents. I can barely afford to run my air conditioner. I certainly can't afford to spay/neuter them all, even with the discounted programs. Pease let me know if your organization can assist me in my efforts to assist them in any way. 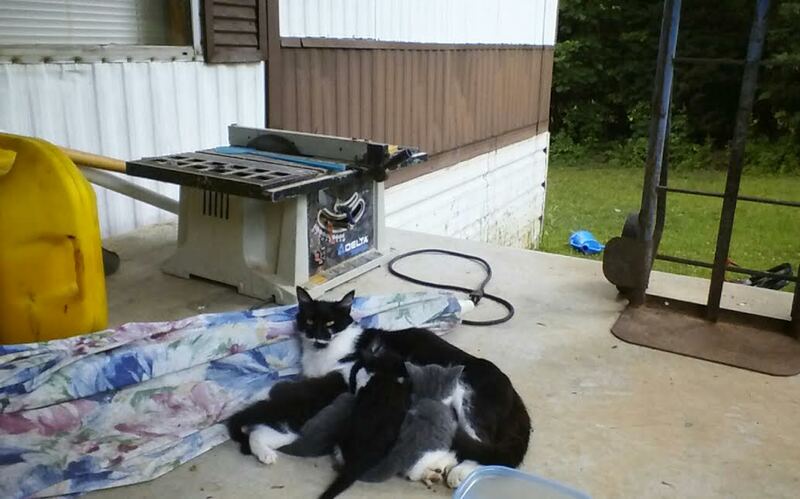 This is the cutest cat family you have ever seen!" 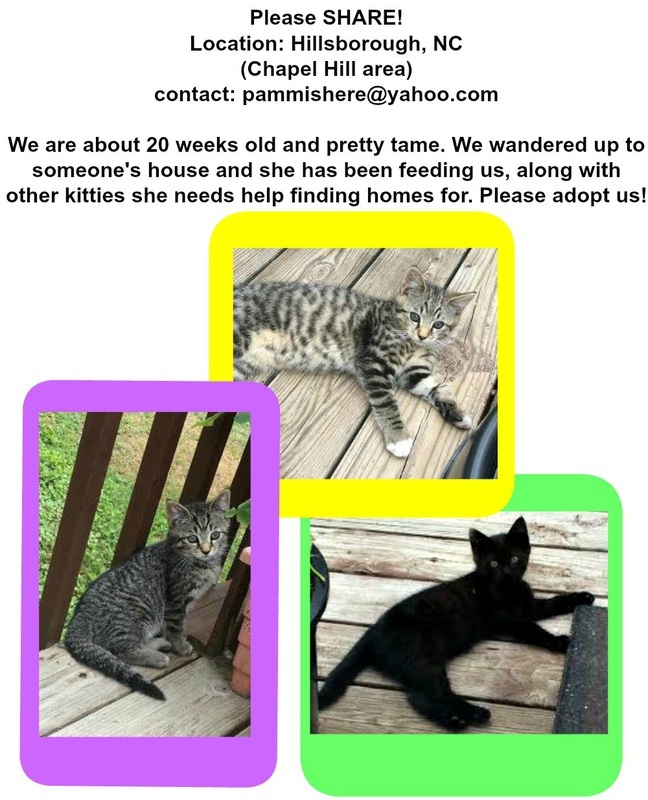 Sparkle Cat Rescue is working to provide resources to have these cats spayed/neutered unless a rescue can take them in. Potential adopters coordinate with the caretaker and SCR so we can ensure no more homeless babies are born. Looking for a 2nd chance forever home. My name is RANGER and I am 5 years old, neutered and up to date on vaccines. I need more attention than I am able to get now. 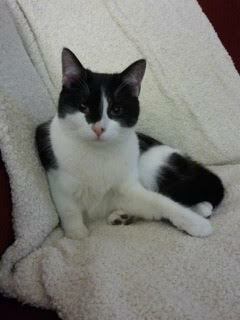 I am a very sweet and affectionate boy and good with older children, great with other cats. I have spent my entire life inside.